Take 1 1/2 cup of water and boil it. Take a bowl, add couscous and pour the boiling water on it. Close it with a lid and let it set for 5 minutes or till the water is absorbed. Take a fork and fluff it up. Take a pan and heat oil. Add onions and saute it for 3-4 minutes. Add tomato puree and saute it till oil leaves the sides of the pan. Add capsicum, rajma, salt, red chilly powder, cumin powder, black pepper and mix it well. Add 1 glass of water and let it simmer for 5-7 minutes. 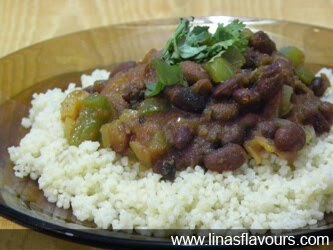 Take a plate and serve couscous. Top it up with rajma and serve it. Garnish it with parsley or coriander.